Which Game of Thrones Character Describes Your Company Culture Strategy? While I envision the only people who may remotely care about reading this are caught up on Game of Thrones, here’s an obligatory sentence to say this might contain spoilers. Also, my analysis of the characters is for the sake of connecting two completely unrelated topics, so have some grace on my layman’s interpretations of the George R.R. Martin universe. It should come as no surprise that this topic wasn’t the one originally assigned to me for Emplify’s April blog calendar. I was first tasked with describing the profile of a cultural champion (which I actually did end up writing, by the way). And to be fair, when I sat down to outline this post, that was my intention. But two glasses of wine and one Game of Thrones teaser trailer later, my mind wandered to how those cultural champions might have fared living in the Seven Kingdoms. Here’s the connection that I’m running with: at Emplify, we believe that villages become kingdoms by investing in their citizens. Our definition of employee engagement is “an employee’s intellectual (head) and emotional (heart) connection with an employer, demonstrated by motivation and commitment (hands) to positively impacting the company vision and goals.” As a cultural champion of your organization, it’s your vow of service to build an army of engaged workers that invest their full selves into growing your business. However, you might be feeling like your company culture strategy isn’t being met with the lavish praise you were hoping for. You’re not alone—out of the 70% of business leaders who believe that having an employee engagement strategy drives results, only 20% of them think their current efforts are actually working. And if you have no way of measuring the impact of your strategy, you won’t know if your attempts to conquer employee disengagement are actually working. You don’t need dragons and magic to have an impact on your employees. It may seem like you have to pull out all of the stops to create an engaged workforce. But you might just need some help identifying some simple, clear steps to take to improve your cultural strategy. Our team tends to divide every company’s people measurement method into one of four quadrants. (Want to know what they really are? Get a demo now.) 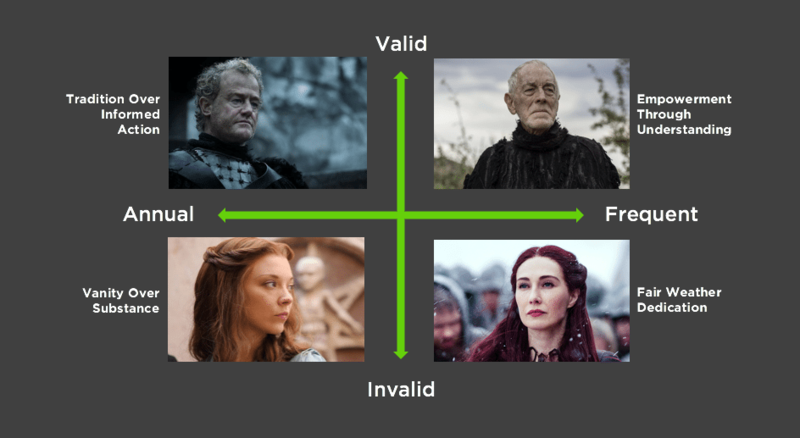 Through my intensive market research of texting my friends and consulting with my husband, I’ve been able to scientifically match our four painstakingly-determined quadrants to the personalities of Game of Thrones characters. Alliser Thorne is a member and one-time commander of the Night’s Watch, a military group that protects the Seven Kingdoms from ice zombies, giants, and attractive nomads. Alliser is sworn to guard The Wall and views anyone beyond the Seven Kingdoms as a threat. In the show, Alliser’s traditionalist thinking gets in the way of potential opportunities to band together with other tribes to maintain the order that the Night’s Watch worked so hard to build. He knew their kingdom was at risk, but he refused to think outside of his regimented system to protect his people and actively mutinied against the Lord Commander who did. So what’s the connection to company culture? Well, Alliser is so obsessed with the black and white rules of guarding the wall that he is unable to rise above these confines and solve true problems based on the bigger picture (the fact that their whole kingdom is at risk unless they band together to fight said ice zombies). If you’re at a company that thinks the best way to build a culture strategy is by surveying your employees just once a year (the “traditional” way), then prepare for your village to be swarmed by high turnover and disengaged employees. Employees need more constant engagement than asking their feedback once a year. A strong employee engagement strategy includes frequent surveying so you can see the complete picture of your cultural health and take action on the weak spots. Margaery Tyrell was married to approximately 17.6 characters on Game of Thrones, all men who were destined to sit on The Iron Throne in King’s Landing. She was determined to secure her legacy as a beautiful, compassionate, cunning queen who spent time helping the impoverished and always being one step ahead of her rivals. But in reality, she always seemed super indecisive, and she never really did anything. She was always receiving advice from her more-informed grandmother, and when one husband died, she looked for the next-best man to help her on her quest for queendom. Her desire to have a certain outward perception clouded her ability to better understand how she could help herself. So what’s the connection to company culture? Well, you may be trying to create an external perception of an “awesome” culture rather than focusing your efforts on internal pain points. Are you constantly scoring high rankings on “Best Places to Work” or other company culture achievement awards, but you’re still seeing good people leave or experiencing underwhelming productivity from your team? That’s because you’re putting vanity metrics over discovering what the true root problems of your disengagement are. Culture awards are a great tool for recruiting and PR, but they should be coupled with another method of truly surveying your team for insights that will help your external and internal culture perceptions be more aligned. Every medieval franchise needs a mysterious villainess, and Melisandre is that character for Game of Thrones. As a priestess for the “Lord of Light,” Melisandre claims that one character on the show, Stannis Baratheon, is destined to sit on the Iron Throne and be the king of the Seven Kingdoms. But when Stannis fails at conquering the road to King’s Landing, Melisandre basically becomes the Game of Thrones version of a bandwagon fan. Next thing you know, she’s obsessed with Jon Snow and telling him the Lord of Light had his eye on him all along. Also, this has nothing to do with my analogy, but let’s just say that Melisandre does NOT age well. So what’s the connection to company culture? Well, if you don’t truly understand what the real priorities are in your organization, you’ll find yourself with a fair weather engagement strategy. That is, you’ll be constantly looking for the next big and exciting perk or change within your business to fix your lagging culture. This can often be true with companies who rely only on pulse surveys to inform their culture strategy. You may constantly be getting feedback from your team, which is great, but if you don’t have time to truly validate the problem, you’ll be chasing after a million small improvements rather than focusing on the one big thing that could vastly improve your employee engagement. Ah, the Three-Eyed Raven (formerly known as Bran Stark). Sometimes he’s a boy, sometimes he’s a bird, and sometimes he’s a tree cave. No matter what form he takes, he exists within the GOT universe to enlighten others with wisdom and context. He is a greenseer, meaning he has the ability to see visions of the past and future, and he uses this gift to guide others as he explores his own visions of the past. So what’s the connection to company culture? Well, in order to know how to truly create positive change within your organization, you need a resource who can provide you with the right wisdom at the right time to know exactly what your company culture’s purpose is. Even if the visions you receive are painful, they should give you the insights and empowerment you need to engage your team. Emplify is the Three-Eyed Raven of employee engagement. Emplify provides companies with the hard truths they need to drive true cultural growth within their organizations, using a psychometrically-valid survey that is grounded in 14 engagement drivers. And because we believe in the value of frequent, but informed, measurement, our surveys are administered in an annual and quarterly cadence that gives you the insights you need at a manageable yet actionable pace. Ready to sit on The Iron Throne of company culture trailblazers? Request a demo of Emplify now.